From the Reutter Porzellan World of Beatrix Potter collection. Diameter: 15cm. Supplied with a plate stand. Coming from the beautiful range of childrens tea sets and collectables based on the enchanting world of Beatrix Potter, this is a 15cm wall plate featuring a colourful, hand-painted design from the literature. 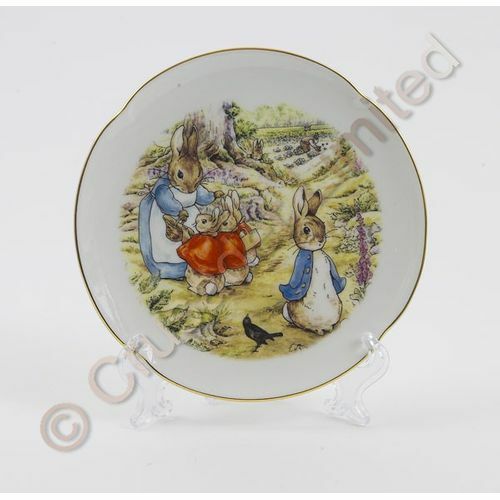 The design shows a scene from Potters best-selling book, The Tale of Peter Rabbit, featuring the titular character and his family; Mrs. Rabbit surrounded by Peters red-coated sisters, Flopsy, Mopsy and Cotton-tail, as they go for a stroll in the charming country lane.